Who Could Resist this Fruit Salad? I seem to be on a kick to beautify the fruit and vegetable world. I have heard from many that small steps lead to big changes and I have to say that I am a fan of this thinking. What if using a star cookie cutter on watermelon makes it into the treat that you desire and you leave the cookies alone? Cool, right? In my school district, they are talking about stopping the birthday cakes, cupcakes, and juice that parents bring to school in order to share their child’s birthday with the class. I find this a bit heavy handed. Instead, I would like to offer suggestions for cupcake alternatives (such as the fruit salad above). It was super fast to make and you can use a few blueberries (they are expensive) and it will still look amazing. All you do is slice the watermelon into thin sheets and cut with a star shaped cookie cutter (or whatever shape you like). Kids love helping with this task. I am not sure where you put the candles but what child wouldn’t love this? I am sure all of you have thought of an alternative to mega-cupcakes for a child’s birthday. Please share below. Our schools ended food birthday treats several years ago, due to allergies, not as a move toward healthier choices. Even this fruit salad wouldn't be allowed. What I didn't understand was a few years later, when our elementary principal then stopped allowing children to bring special pencils, erasers, or stickers to share with classmates to celebrate their birthdays. Frozen blueberries from Costco and Sams are very affordable and every bit as delicious and nutritious as fresh. They also have huge bags of strawberries and mixed fruit that would be easy to transport and serve. A nice squirt of whipped cream on top would make it irresistible: some kind of sprinkles on top of the whipped cream would make it playful with very few calories and sugar. I work with people all over the country with weight and eating issues, and frozen fruit is often an item that people don't even think about. Believe me, you will never be without it if you give it a try. My day starts with a blender full of frozen fruit, almond milk or powdered milk, and almonds. Blueberries are low in calories and very, very nutritious, they make a great shake. You can drink a large portion, and you will be more than full all morning. It is great for lunch and dinner, too. So easy to fix and economical. Frozen fruit: affordable, easy to transport, beautiful colors, delicious treat. Much better than cupcakes! Our school district requires store bought treats due to allergies and "unknown" kitchen cleanliness. There are excellent reasons to end the school birthday celebrations - religion, disruption in class (7 birthdays last week - in one class alone!) - but mostly economical. Many find it hard to believe but there are families that cannot afford to provide treats to an entire class. That child then feels left out and is "tagged" - this is what we try so hard to avoid in school. Announcing birthday kids names on the morning announcements and leaving it at this would be so much easier. What child wouldn't love this? One whose bliss point is so high that they perceive it as bitter. Our children are poisoned with sugar from day one....why? Because "they're kids." This line is used by too many adults as a means to excuse the countless grocery aisles and bakeries filled with sugar bombs, the candy holidays (Halloween, Easter, Valentine's, Christmas) which come earlier and last longer each year, as well as bad behavior in general. Why do you think the world is obese? Kids don't even know what vegetables are these days. Their organs are bathed in carcinogenic sugar. They have cardiovascular disease in their young age. The body processes sucrose the same way it does alcohol. Beer belly is the same as sugar belly, just without the buzz. They both cause fatty liver and vascular disease. Sugar is more addicting than heroin. Why anyone would intentionally put the white (or brown) poison in their food is simply because they don't know or don't care. "Sugar: The bitter truth", by Pediatric Endocrinologist, Robert Lustig, M.D. Frozen fruit is available at the dollar store too. Dollar Tree is one I visit regularly. I buy blueberries, which I cook with my banana and oatmeal every morning. Also available are frozen strawberries, mango, pineapples, and mixed berries. Good stuff. I use them for frozen daiquiries when I get together with my friends on Friday nights. 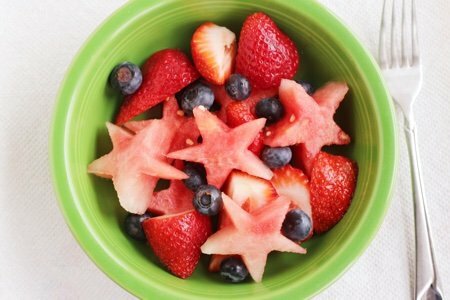 Watermelon stars! Look inviting and very cute for kids. @Kitty: I watched Dr Lustig's "Sugar: The Bitter Truth" on Youtube a few years ago. It's very worthwhile viewing for everyone even those in the know about sugar. I don't have children yet, so I guess now I have a heads up about birthday treats. I remember when I was in school I went to Alpac Elementary in WA and the principal had a large birthday lunch for all the kids who had birthdays in that month (Hey Mr. Ray)It was I believed catered by Hardees and you had a choice of hamburger or cheeseburger and then it had a toy in it just like with a Happy meal, but your beverage came in a decorative cup with a crazy straw, so it was a lot of fun. Since I live in CA once it starts to heat up, I'm all about fruit salads! As it gets warmer who wants to continue to swelter in the kitchen give me a salad of whatever variety. We have done several different fun things: Peel a whole melon then cut a piece off the bottom to make it flat, stand it up and then using toothpicks attach other fruit onto the sides. It is nice when the pieces of other fruit are cut into fun shapes like stars. Birthday candles stick into fruit easily too! We have also had a candle stuck into hummus to go along with a rainbow variety of veggies.